Overview: Alison Blaire wants nothing more in her life than to sing. Whether it’s for one person or 20,000, Alison wants to take to the stage and sing her heart out. What most people don’t know is that Alison is a mutant, being able to absorb sound and transform it into light. All things considered, that’s a pretty good mutant power to have if you want to be a performer. Taking the stage under the name Dazzler, Alison is ready for her time in the spotlight. Unfortunately, trouble seems to find Dazzler wherever she goes. Whether it’s the X-Men fighting the Hellfire Club or the Enchantress crashing an audition or Bruce Banner getting upset at a college campus where Dazzler is performing, she finds herself having to user her powers like a superhero, something she truly does not want to be. In addition to our title character, we meet the members of her band, along with her agent and road manager. We also meet her father Carter Blaire, a lawyer who wants his daughter to follow his career path. Alison’s missing mother was a singer, but disappeared when Alison was an infant. But like any good dangling plot thread, we eventually find Alison’s mother at the conclusion of this volume. Along the way, Dazzler crosses paths with many Marvel heroes. She meets She-Hulk in Los Angeles and Spider-Woman in San Francisco during a west coast tour. From the X-Men, the Angel develops a crush on her, and does everything he can to woo her over. And she gets the opportunity to jam with the Fantastic Four, with Johnny on guitar and Ben on sax. Seriously! I could not make this stuff up if I tried. The plan was to release Dazzler #1 to coincide with the album release. But Casablanca dropped the project and never released the album. Marvel went ahead and finally released the title nearly a year after her last appearance, and the series ran for nearly five years. The first year was one guest star (or villain) after another, in an effort to build up the fan base for the title — Spider-Man, the Avengers, the Fantastic Four, the X-Men, Dr. Doom, the Hulk, and even Galactus! What makes this Essential? 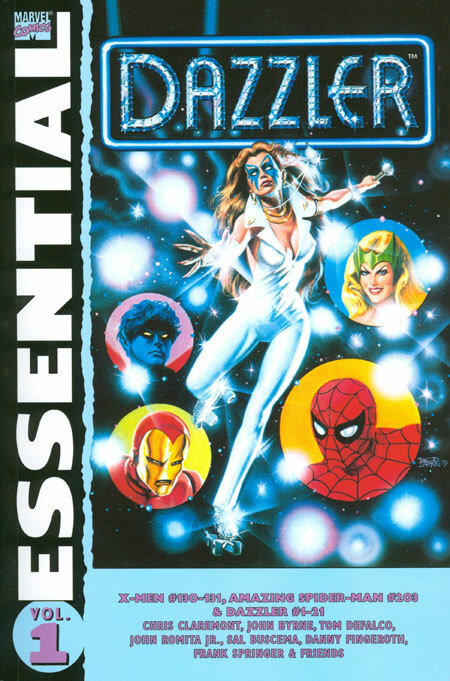 : OK, we can make a lot of jokes about “Essential Dazzler” being an oxymoron. Trust me, I made a lot of the jokes myself early on. That said, this is an important book in terms of female Marvel characters. In the late 1970s, Marvel introduced four titles focused on female heroes – Spider-Woman, She-Hulk, Ms. Marvel, and Dazzler. The first three are just female analogs of their male counterparts. Dazzler was the only female character featured that was unique in her own right. Although these books were not the best sellers, Marvel remained committed to publishing the characters, long enough to warrant six Essential volumes from these four characters. Now, as much as I want to praise Dazzler as a character, Dazzler as a monthly comic was not that great. There are times when the story felt more like a romance book – does Alison want to date the ER doctor or her lawyer? And will she ever receive her father’s blessing for her career choice? While the art is serviceable, there are too many panels showing Alison changing clothes. That may be appealing to the young male reader, but it’s not necessary to show that scene in that panel to advance the story. EVER! Footnotes: Uncanny X-Men #130 and #131 are also reprinted in Essential X-Men Vol. 2. Amazing Spider-Man #203 is also reprinted in Essential Spider-Man Vol. 9. If you like this volume, try: Stars and S.T.R.I.P.E. by Geoff Johns and Lee Moder from 1999. I know I am crossing the streams here between Marvel and DC, but hear me out. Courtney Whitmore’s teenage life just gets worse and worse. Her mom has just remarried, and she now has a creepy stepbrother to deal with; her family has moved to small town Blue Valley; and then she finds out that her stepdad used to be a super-hero. Using a cosmic belt first developed by Starman and later used by the Star-Spangled Kid, Courtney becomes a modern day Star-Spangled Kid, fighting the surprising number of super-villains based in her small town. The series only ran for a little more than a year. Where I see the parallels with Dazzler is her post-title career. Using the new codename Stargirl, Courtney became a member of the reformed Justice Society, becoming a key member for many years. Her popularity led to Stargirl being used on the Justice League Unlimited cartoon, and she continues to thrive in the new DC 52 universe. Following her title cancellation, Dazzler ended up joining the X-Men, and became a key member throughout the 1990s. She still remains a member of one of the many X-Men teams today. The entire Stars and S.T.R.I.P.E. series is available in two trade paperbacks. This entry was posted in Dazzler, Marvel Essentials and tagged Chris Claremont, Danny Fingeroth, Dazzler, Frank Springer, John Byrne, John Romita Jr., Tom DeFalco. Bookmark the permalink. Pingback: Throwback Thursday – On My Way to Sunny California… | WORST. COMIC. PODCAST. EVER!